For instance, the home you purchased 3 years ago for $325,000 is now worth $250,000, but you still owe $300,000 on the mortgage. If you list the property for sale, you would need to fetch an offer north of $300,000 just to pay closing costs and the mortgage. Since the market will only provide an offer of $250,000, the mortgage would need to “short” it’s payoff in order for the escrow transaction to close. This transaction can be negotiated by the seller, the buyer, or even the mortgage company and is known as a short sale. The number of short sale transactions has intensified tremendously in recent years due to the decline in the real estate market. Many people engaging in a short sale transaction do not fully understand the legal complexities involved this area of practice. Capital gains, cancellation of debt, and deficiency liability are only a few of the many legal issues and pitfalls that must be carefully reviewed when considering a short sale in San Diego. San Diego Bankruptcy Attorney Shawn A. Doan has the experience and knowledge to guide you through the short sale process. Please see the FAQ for additional foreclosure alternatives, or fill out your Free Online Case Evaluation to get started. Lien stripping is for individuals desiring to reorganize their debt using Federal Laws under Title 11 of the United States Code. Shawn A. Doan can actually remove junior mortgages in the context of a reorganization, which is also known as Chapter 13. If you own a home with more than one mortgage, in most cases we can remove or “avoid” the second and subsequent junior mortgages from your home and county records, thereby leaving only the first original mortgage! If you qualify, all mortgages except the first would no longer be secured by your home, and you would stop all payments except the first immediately. Chapter 13 bankruptcy is similar to debt consolidation, in which you make one monthly payment to a Chapter 13 trustee who will then disperse payments to your creditors, as outlined by the plan you file in court. In certain cases Chapter 13 has some advantages over Chapter 7, such as the ability to remove second mortgages. Shawn A. Doan will review with you the advantages of each chapter in light of your specific situation so that you can obtain the best possible financial solution. With the collapse of the United States Real Estate market, and increase in short sales, the short sale environment has become very advantageous. Short sales are now very common, move through escrow much more quickly, and in many cases are preferred by lenders over foreclosure. Most importantly, they are now much more advantageous to a debtor than in the past. Equity Recoupment allows you to recoup what you may have lost as a result of predatory lending and the current mortgage crisis. With the law on his side, Shawn A. Doan is able to keep his clients in their homes for 8-12 months to several years without making a single payment! As an example of equity recoupment, if your monthly payment is $4,000 per month, in 12 months you will recoup $48,000, in 2 years $96,000. Your recoupment will continue to grow the longer you are able to stay in your home. The record recoupment holder so far among Mr. Doan’s many clients is a family that has been residing in their home for nearly 4 years now. In just a few more short months, they will have recouped approximately $10,000/mo times 48 months or $480,000.00 dollars, nearly half a million dollars! 3	Put money in your pocket. Though it may seem simple, it is actually a complicated process requiring competent legal and tax advice. This past January, lenders took back roughly 91,000 distressed homes, and these numbers are up 29% since the previous month. A distressed property is a home that has either gone through foreclosure or is being marketed as a “short sale.” Currently, distressed properties account for nearly a third of all home sales in the United States and these numbers are on a steady incline. The recent increase of distressed homes is predicted to result in further price drops in the housing market. Distressed home sales account for approximately 35% of all of the the total home sales in January, these numbers are up 16% from June. During that time, the average home price declined nearly 9% to $154,000. And home prices are expected to dip down even further. Buyers are the ones monetarily benefiting from this market. They are able to buy a distressed home for a reasonably low price and they are also able to take advantage of a non distressed sale if it’s in an area where a significant amount of homes are in foreclosure. However, buying a distressed home may come with home repairs which will cost additional time and money. As more homes are foreclosed upon, experts predict that homeowners will feel the pinch in their own neighborhoods. More foreclosures in your area can result in loss of home equity, making it more difficult to borrow against homes for repairs and renovations. Despite the bank’s efforts at putting foreclosed homes back on the market, specialists expect homeowners to still feel the impact of a distressed property by their own property value dropping about 1% when they are within one eighth of a mile from the foreclosed home. In addition to this, when the foreclosed home is actually sold, homes within a quarter mile lose approximately 4% of their total value. The Journey of Real Estate Finance and Economics believe that it will take between two and five years to regain this loss. Real estate professionals believe that homeowners who want to sell their property should expect getting less for their property than imagined because they are contending with distressed homes that could possibly sell for a 29% discount. 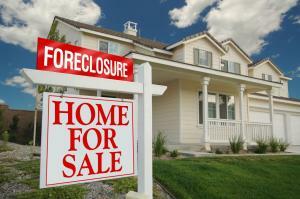 In Las Vegas, foreclosed home sales made up 59% of all home sales with an average discount of 19%. Half of all home sales were foreclosures in Sacramento, these homes were sold at a 25% discount. While buyers are getting a great deal on a home, our neighborhoods are seeing the brunt the housing market all across the country.